Welcome to another cottage tour here at A Joyful Cottage. 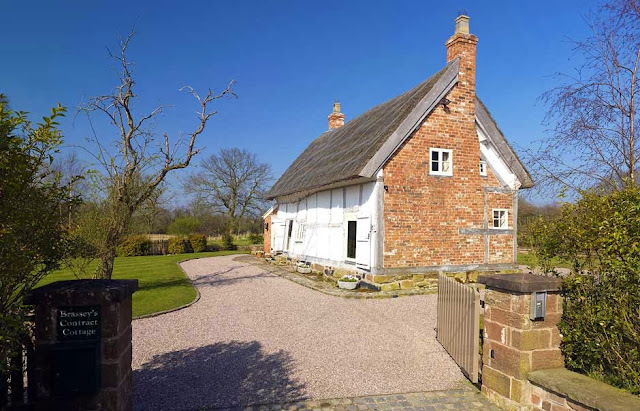 It's my pleasure to show you Brassey's Contract Cottage, a meticulously restored half-timbered 17th century thatched cottage located in the town of Edge in south Cheshire. 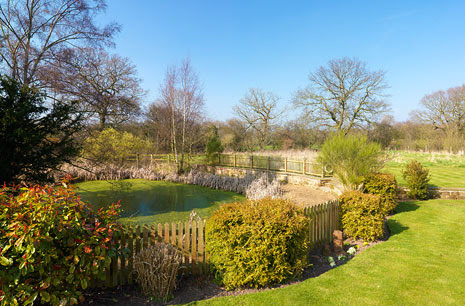 The cottage is named for the British civil engineering contractor Thomas Brassey (1805-1870). It was here that Brassey closed the deal to purchase the land for the railway line between Chester and Shrewsbury. 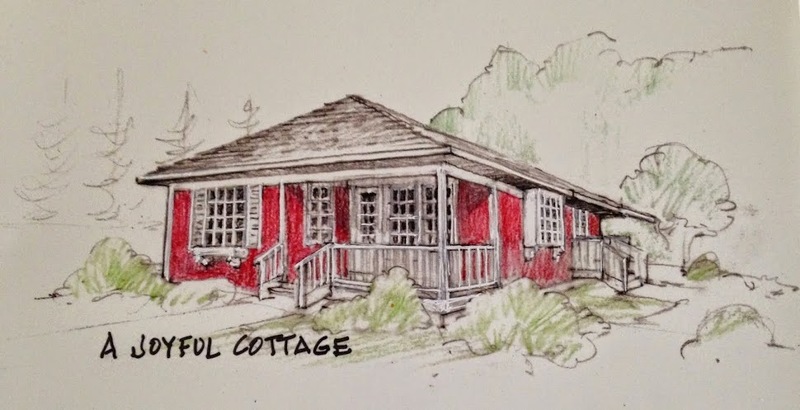 When the present owners purchased the cottage it was in a severely deteriorated state. They have lovingly restored it to its current beautiful condition. This cottage is delightful in both its architecture and its décor. The kitchen bubbles over with charm. Take a look at that chandelier and the exposed beams. And who could pass up the apron front sink? I do believe this is a kitchen out of my dreams. Just the right shade of creamy yellow on the walls to contrast with the white cabinetry and open shelving, and the slate counter tops. 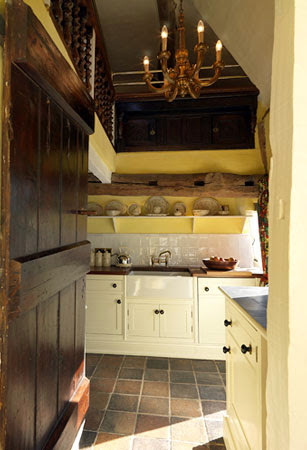 The cream built-in cooker with the black pipe tops off this cottage kitchen. The warm and cozy drawing room pairs antiques with modern furnishings for a classic traditional look. The equestrian paintings, the leather chairs, and the cupboard in the corner all work beautifully with the exposed beam ceiling and the large fireplace. The floral fabric and ruffled lamp shade soften the room's mood, keeping it from feeling too masculine. Even something simple like adding a table with curved legs can keep a room from appearing severe. The sitting room is light and cheery in pale blue with a hint of cocoa. 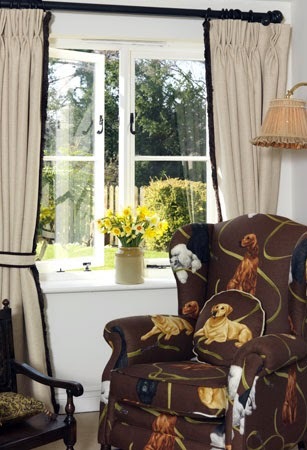 I love this wingback chair upholstered in a dog print. The chair, along with the tailored window treatment tones down the feminine qualities of this room just enough. I really like the way the owner has added just the right touches in each room to accomplish this balance. 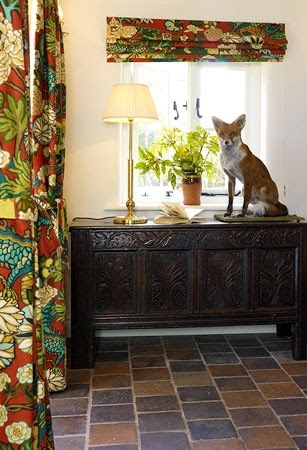 Here again, the dark coffer and the fox are overtly masculine, but the floral fabric and the slim lamp add ladylike touches to this hallway. 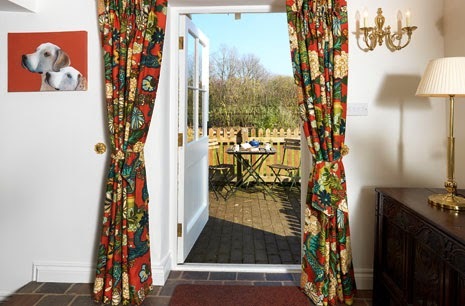 While the fabrics and patterns vary from room to room, the colors flow. There is a hint of pale blue in the drawing room that repeats predominantly in the sitting room. Beige in the sitting room is picked up in the hallway fabric, and the added blue and red in that fabric is repeated in the dining room's chairs and the blue and white plate display, and ties in with the drawing room's blues and reds. Books in the library continue the color flow; picking up the reds, blues, beiges and cocoa. So subtle, yet very effective. The same multi-colored striped carpet in the drawing room is used on the stairs and in the master bedroom. Red pops throughout this room. 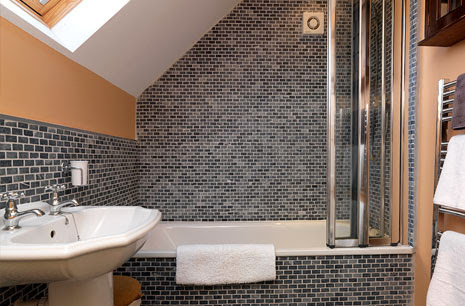 The master bath colors tie in with the bedroom carpet. 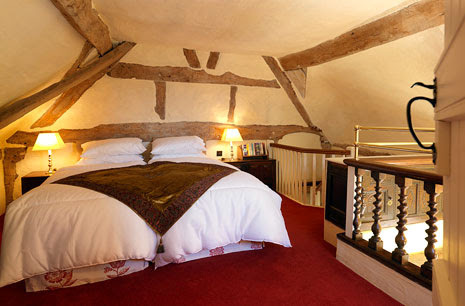 Another bedroom is tucked under the thatched roof. Very charming. This is a second bath. I wanted you to see this stylish sink. Outside the cottage garden invites lingering, and leisurely walks. 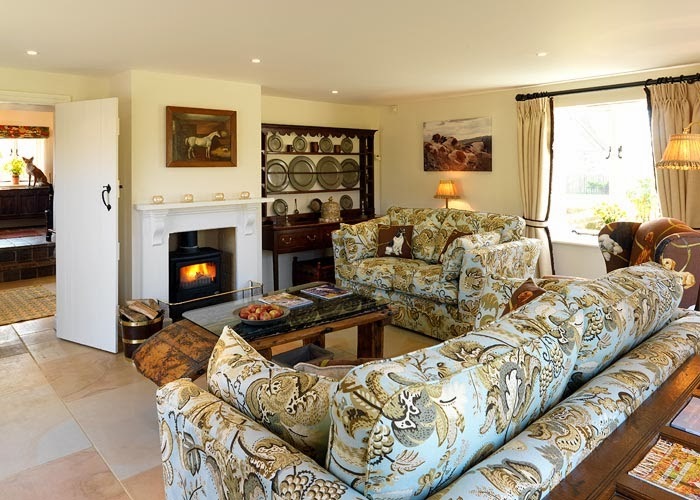 A big thank you to Caroline of Blaentrothy Holiday Cottages for allowing me the privilege of featuring Brassey's Contract Cottage at A Joyful Cottage. 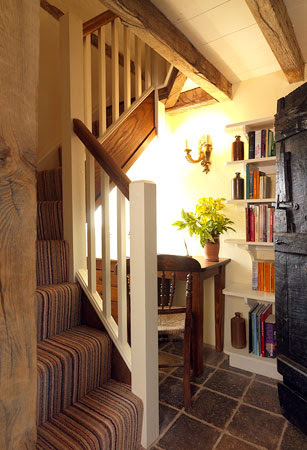 You can learn more about this wonderful cottage on the Blaentrothy Holiday Cottages website. 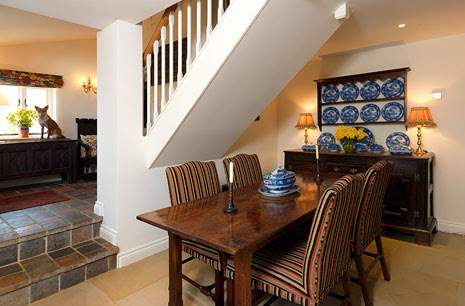 I hope you've enjoyed our tour of this lovely rescued cottage. What do you think of it? That's really neat! I would love to live in a cottage! My parents' house looks like a cottage from the outside, but it is a Sears house. I think the Sears homes are really interesting. Especially if they haven't been remodeled. There's a Sears home for sale in a nearby town, but they've put an apartment on the second floor. Sad. Nancy, the cottage tour was so much fun. That kitchen- yes, I believe you're right- it's the kitchen of my dreams. I love the massive door that opens into the kitchen. Then there's that door in the library (the big dark one to the right)- so rustic and grand. The master bedroom may be my favorite- I'm a big fan of all things red, so it really caught my eye. And again, the door in the master- fantastic (that hardware!). So charming . . . I loved seeing this cottage! I'm glad you enjoyed it, Lynne. Love it -- so cozy! Yes, it is cozy. Which is what a cottage should be. Hope you have a great week, Nancy. Nancy, I love that drawing room...wouldn't it be wonderful to have a drawing room? The beams in the kitchen are dreamy, too. 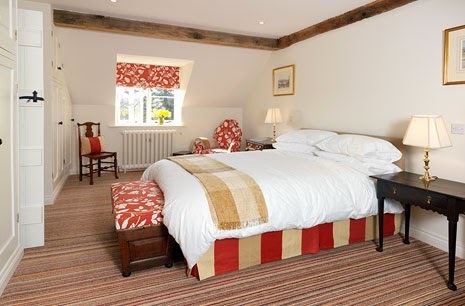 Of course, I just adore the red in the bedrooms! Thanks for sharing~ I love to peek inside! Yes, Kim, it would be wonderful to have a drawing room. 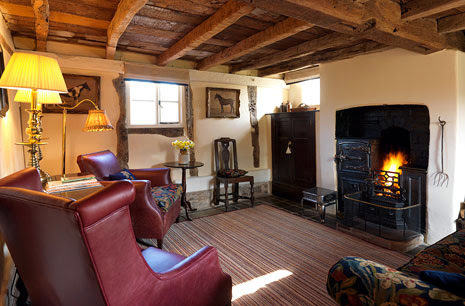 Especially one with a big fireplace and beams like that. 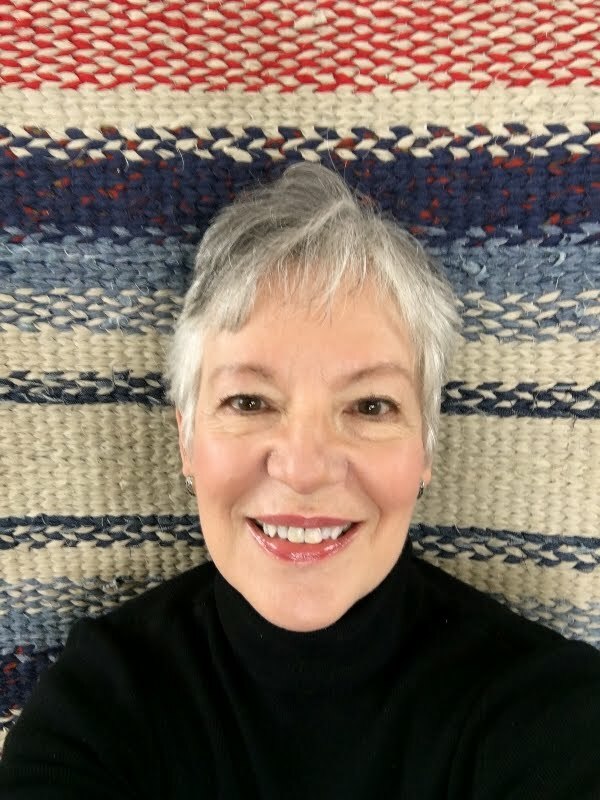 Hi Anne, I think so, too. Glad you were able to stop by. Very cozy and warm. I like the bathroom with the sink spout in the corner. 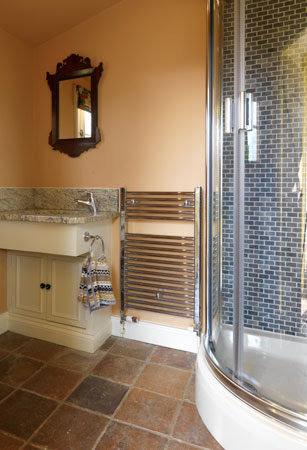 I need to keep something like that in mind for my small bath in my bedroom, like that corner shower too. One can get some good ideas from seeing some pretty cottages such as one you posted. Nancy, I really enjoyed this....my favorite of all is the kitchen. And yes, it is just the perfect yellow. 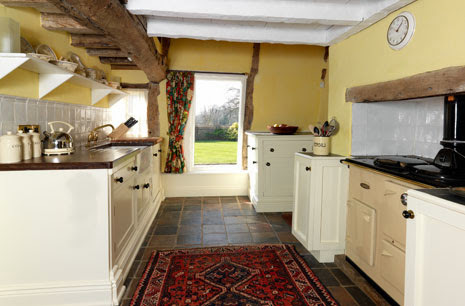 I had a Home Ec teacher say that it was a bad idea to use yellow in a kitchen...I so disagree with her. Yellow makes me happy just looking at it...I really loved all the cottage, though. As to the Markle House, I do hope I can capture it in snow....that is not generally the direction I head if heading for snow pics, but I am with you in wanting to have one in snow. And spring. I'd love to have a holiday in this beauty of a cottage! The kitchen is a gem with that unusual heavy chandelier suiting the dark wood around the upper part of the kitchen. Of course the cooker had to be there. I wonder if I'd ever learn how to operate one? The fireplace in the living room even looks like there are ovens built into it. I loved the pewter on the dresser in the sitting room. I liked reading what you had to say about the color flow in the house. I never think about that but I know it would help if I did. Loved the tour! And thank you so much for your sweet comment at my place today. I appreciated it so much. I loved the tour Nancy. My favorite is the kitchen and the garden! Thanks for sharing it with us. 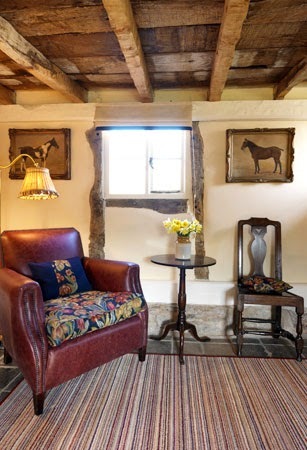 Thank you for this FABULOUS post; LOVED reading about this cottage and seeing the great photos. I'm so glad you enjoyed it. Your comment is an encouragement to me. Thank you.